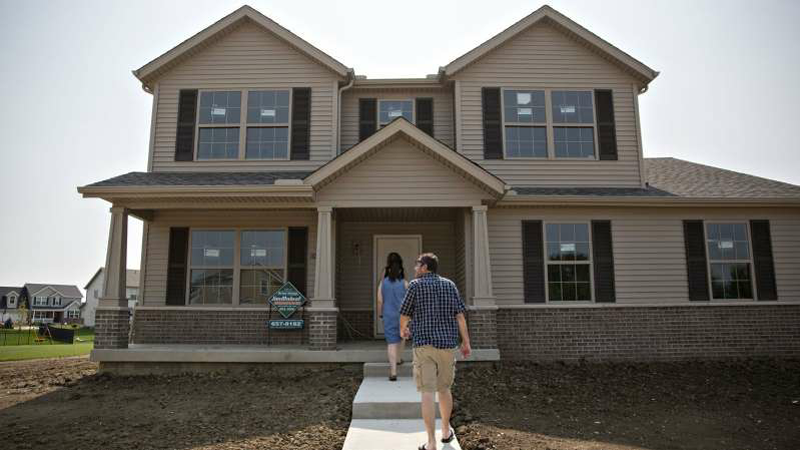 © Bloomberg Prospective home buyers arrive to tour a house for sale in Dunlap, Illinois. Sales of new U.S. homes unexpectedly rose in December after a downwardly revised November reading, as lower mortgage rates and more-affordable properties offered some relief for buyers. Single-family home sales increased from the prior month to a 621,000 annualized pace, according to a government report Tuesday that was delayed more than a month by the partial government shutdown. While that's above the median analyst estimate, the November figure was revised down by 58,000, and October's reading was also lower than previously reported. Sales probably got a lift from improved affordability, with the median sales price down 7.2 percent from a year earlier. The number of homes for sale where construction hadn't started rose to the highest since 2007, indicating more supply that could hold down prices or push them even lower. In addition, the housing market is likely getting support from a decline in mortgage rates, as well as a strong job market. Also, wage gains are outpacing home-price increases by some measures for the first time in several years. The latest reading is still below the pace in early 2018, and residential investment has been a drag on economic growth for four straight quarters. Previous data showed housing starts dropped to a two-year low in December while existing home sales -- which account for the bulk of the market -- fell in January to the slowest pace since 2015. The number of properties sold for which construction hadn’t yet started rose to 213,000, the highest since 2017, indicating a steady pipeline of building work. Purchases of new homes rose in three of four U.S. regions, led by the biggest jump in the Northeast since 2015 and a 5 percent increase in the South. Sales in the Midwest fell to the lowest since April 2016. The supply of homes at the current sales rate fell to 6.6 months from 6.7 months. The number of new homes for sale at the end of the month increased to 344,000, the highest since 2008, indicating more-ample supply. New-home purchases are seen as a timelier barometer of the market, as they’re tabulated when contracts are signed, while sales of previously-owned homes are calculated when contracts close. The report, released jointly by the Census Bureau and Department of Housing and Urban Development, tends to be volatile from month to month: it showed 90 percent confidence that the change in sales last month ranged from a 12.7 percent drop to a 20.1 percent increase. This month will see three reports on new-home sales thanks to delays from the shutdown: January figures will be released March 14 and February data are due March 29.